There are a million different photographers out there! While we deliver a top quality service, we make sure we keep the price of creating your lifetime memories affordable. Expect your Goldilox photographer to be excellent at interacting with a range of people. Whether the occasion is studio based or on location they will be an instinctive communicator, offering flexibility and versatility. They will bring their own high standards of Photography but equally be totally open to other points of view and other possible ideas on the day. With particular reference to very young people; be assured your photographer will be up to speed with everything Peppa Pig through to Buzz Lightyear, they'll sing songs and dance around - whatever it takes to get the best shots and spontaneous images of the young people involved. An instinctive communicator, offering flexibility and versatility on the day. Moments are captured with artistic and technical skill of the photographer, images can be further enhanced through post processing software available. Customers sometimes have preferences for the particular shape, style, colour of a shot... all are very welcomed to be discussed at the time of the shoot. Customers sometimes have preferences for the particular shape, style, colour of a shot... all are very welcomed to be discussed. Before the camera starts clicking time is taken to understand who you are and the specifics of what you are after. We continually and actively seek ways to capture your feedback, it is important to us and we welcome any suggestions to make your time and experience even greater than it will be for the next time you visit us. 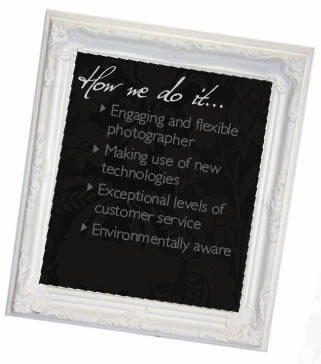 ...we continually and actively seek ways to capture your feedback, it is important to us. I am completely devoted to my three children, my husband and my camera! Our home is filled with pictures of moments we have experienced in life so far, and I genuinely think the images create a warmer and more positive home for us to grow up in. I'm a genuine lover of the fairytale moments in life, as well as a photographer I've conducted a great number of weddings as a Registrar. With a passion for witnessing, as well as capturing on camera, those moments of intimacy, love for another, laughter or poignancy, I strive to take photographs that will conjour emotion, and tell a part of your story, each time you view. Photographing people is a complete privilege. If I was picking someone to take my pictures, I'd want to make sure the photographer could put me at ease and make me feel comfortable, skilfully take and present beautiful pictures and importantly that it wouldn't cost the earth.